How to tell when your always-full schedule is easing up: calculate the degree of knitting and stray balls of yarn on your work table. I don't do well in a messy space generally but it's pretty hard not to love this one! Just being able to have knitting out and available to pick up and work on is so very nice. 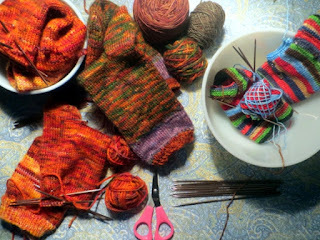 The reason I was taking time to work on my own socks has nothing to do with my well-documented selfish knitter status. It was because Julia takes a smaller shoe size than I do, and I wanted to be sure her socks were a bit shorter than mine. And... I couldn't find any other pair of socks I'd knit for myself in this weight of yarn. Yeah, that's it. Ahem. The socks grew a little more after I took this picture and now they are sitting on another work table - the one in the bright sunny corner of the living room, where I do my grafting. The toes are both still open and all the ends have to be run in before I can send them off to a part of Canada that gets a lot of snow and cold temperatures starting about - now. So I should really focus on them too, and get them to Julia where they can do the most good. I am completely smitten with these stripeys. I've been wearing the laceback pair I made all through the cooler weather this fall - amazingly, the grey of that yarn is a great match for the grey wool sweater coat I found in a spring sale (cashmere and merino blend, HEAVEN) - but I am excited to wear these ones too. They would be fabulous with my bright red parka... if I can track down some gloves to wear underneath them from one of the boxes that is still packed up. The main thing I am excited about with these mitts is that they are easy to knit. I have wanted a mitt pattern like this for pretty much ever, one that requires minimal shaping and can be memorized quickly before being knit over and over for loads of people. You have to be able to knit in the round but because they use up scrap sock yarn I'm guessing that they will be knit by people who do that all the time. 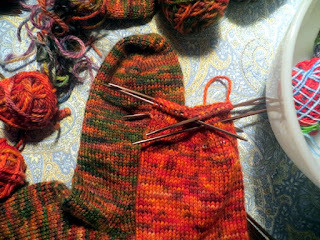 Apart from that, it's just knit and purl and a couple of very basic decreases, slipping end stitches around the thumb opening, and picking up the slipped stitches for new ones - another common sock skill. 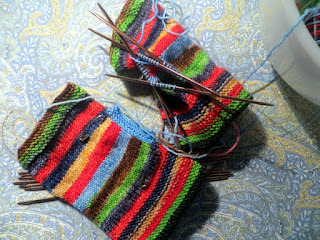 Hmmmm... it occurs to me that the less I talk about the mitts, the more time I will have for getting that pattern out into the world. So - off I go! Hope you've all had a wonderful weekend with knitting in it. I'll see you again in a day or two - take care in the meantime okay? That IS a lovely work surface! & I've been sneaking in some selfish knitting too. After all, It's MY craft, tools, yarns, & time. I'm looking forward to finally knitting a pair of mitts for myself, as well. You are so wise to take time for personal knitting :^) I have some gift sewing to do too and it is getting very noisy as my delivery deadline approaches, but I was NOT going to go out tomorrow without a really warm hat. It is supposed to be super cold and I only have a sport weight option. Priorities!